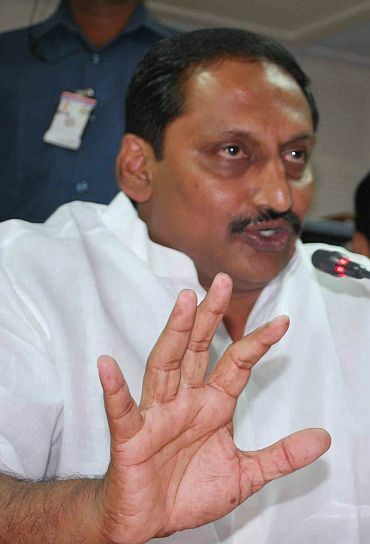 Andhra Pradesh Chief Minister N Kiran Kumar Reddy and his cabinet colleagues, barring two, from coastal Andhra and Rayalaseema regions on Wednesday submitted “affidavits” stating their opposition to the proposed bifurcation of the state and rejecting the AP Reorganisation Bill-2013. Congress members of Legislative Assembly from Seemaandhra region also submitted similar affidavits to Assembly Speaker Nadendla Manohar, with a request that they be forwarded to the President of India. With the extended deadline set by the President for the Legislature to express its views supposed to end tomorrow -- and with no indications yet of its possible extension -- the chief minister, ministers and MLAs submitted their views against the Bill in the form of affidavits. “We are opposing the proposed bifurcation of Andhra Pradesh. As such we are rejecting the AP Reorganisation Bill-2013," they said. They pointed out that the provisions contained in the Bill were detrimental to the interests of the state. Only the chief minister and a couple of ministers from Seemaandhra actually spoke in the Assembly on the Bill while a few MLAs also expressed their views. Since the House was stuck in a fresh pandemonium for the past three days, more ministers and legislators who were supposed to speak could not get the chance. The chief minister on Tuesday wrote a letter to the President seeking extension of time by three weeks for the Legislature to discuss the Bill and return it with its views. The chief minister also issued a notice to the Speaker on Saturday last seeking to move a resolution in the assembly to reject the AP Reorganisation Bill and return it to the Centre. While the Seemaandhra side has been insisting on the resolution and voting, the Telangana side is stoutly opposing it. This has resulted in a logjam in the House.